The diversity of sound's investigations and the artistic creation are since always center of the own approach of Sylvaine Hélary, a process tinged with the highest requirement and an insatiable curiosity. The use of four flutes and of the voice, the work of composition and improvisation are declined in singular ways within very different bands : sometimes acoustic (Spring Roll), sometimes electric (Glowing Life), occasionally staging or spatialize (Printemps), music orchestrated or on the contrary shipped under a form more raw and minimal. 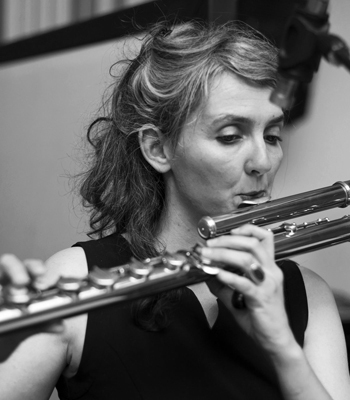 Sylvaine Hélary, flutist with multiple facets, belongs to those soloists who builds a natural link between contemporary music, jazz and various currents of new music. As such, she is regularly invited by French or international artists, like Marc Ducret, Alexandra Grimal, Jozef Dumoulin, Ève Risser, Matt Mitchell, Kris Davis, Nicole Mitchell, The Bridge (transatlantic exchange program), etc. Also fascinated by pedagogy, she conducts frequently workshops about her instrument and her compositions. Thereby she wishes to meet and reach all kind of audience.